This Fresh Lychee Rose cake received so much praises that it will be a sin not to share them with my followers. 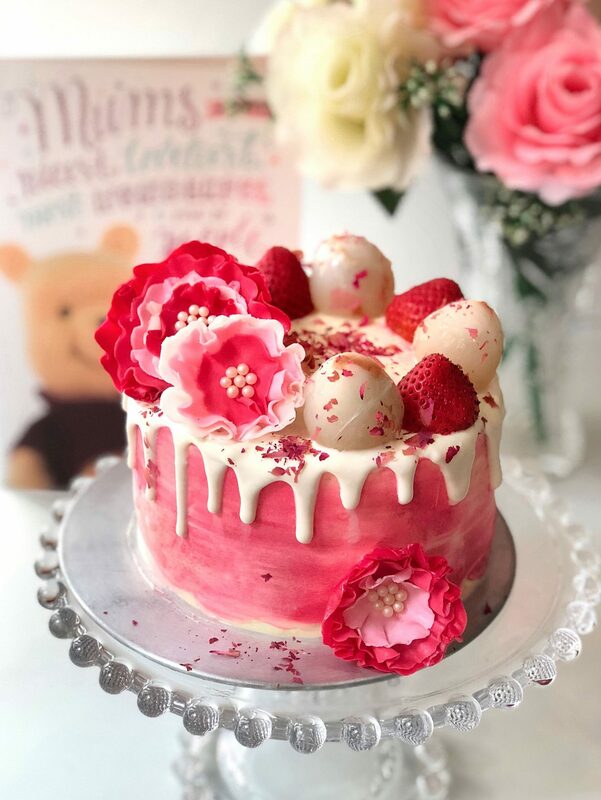 The floral tone accompanied with the sweet scent of fresh lychee makes this cake super refreshing and delightful to eat. 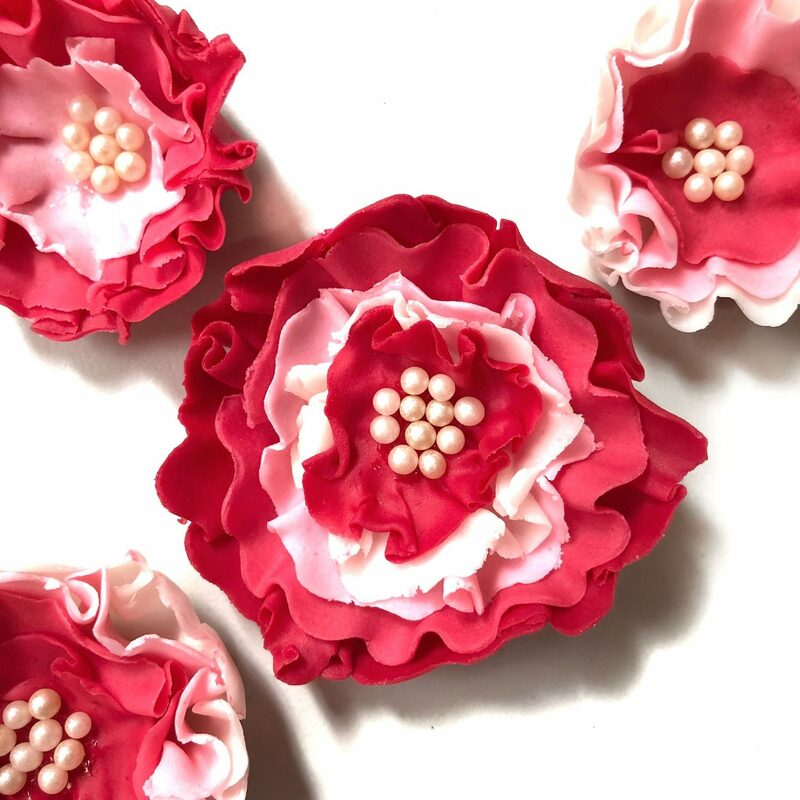 It doesn’t surprise me that most of the cake orders for Mummy or for client’s Mum are somewhat rose, flower related. 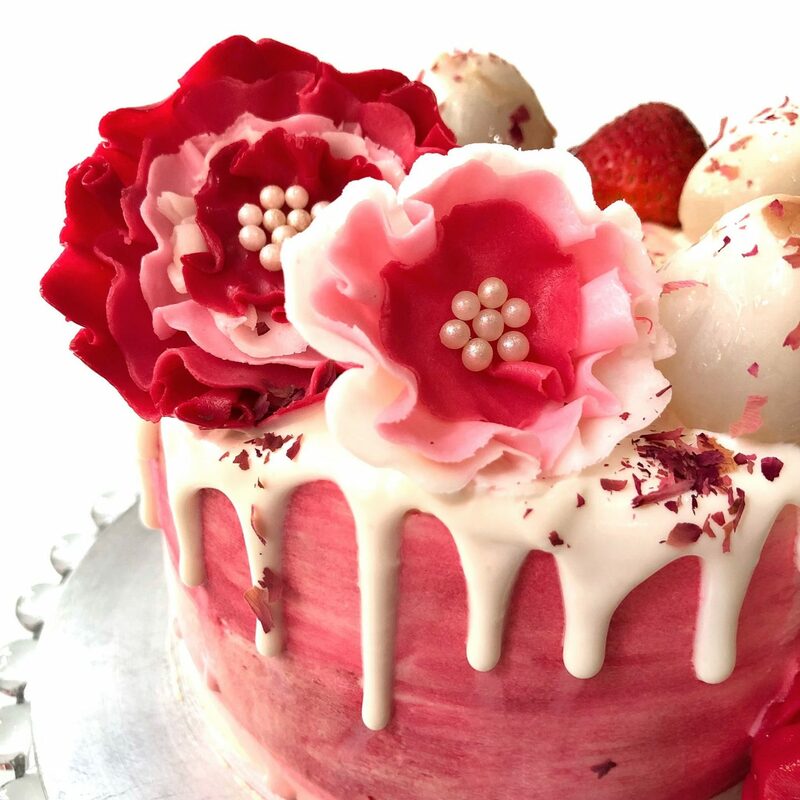 You can check out some of the beautiful drip ombre cake or my signature rose petal cake. 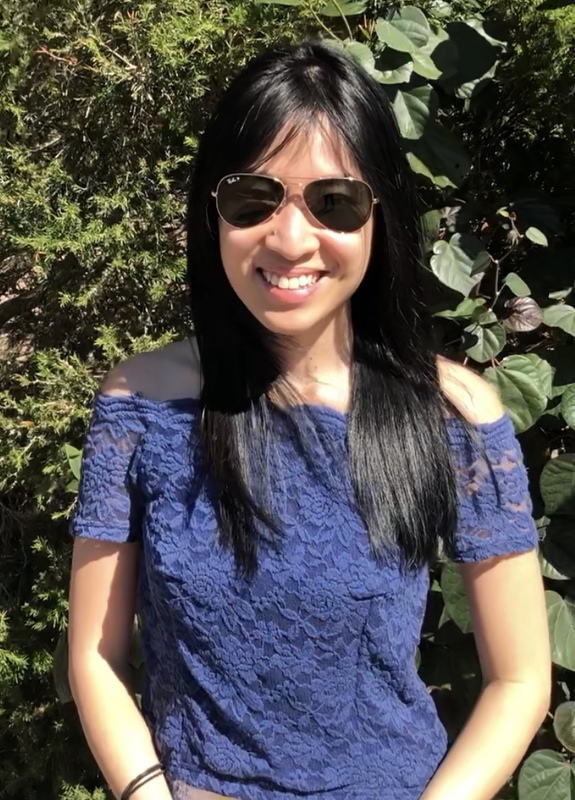 If you have not tried making a Lychee Rose Cake, you Should! You’ll know what I mean after consuming a bite or a slice or the entire cake. 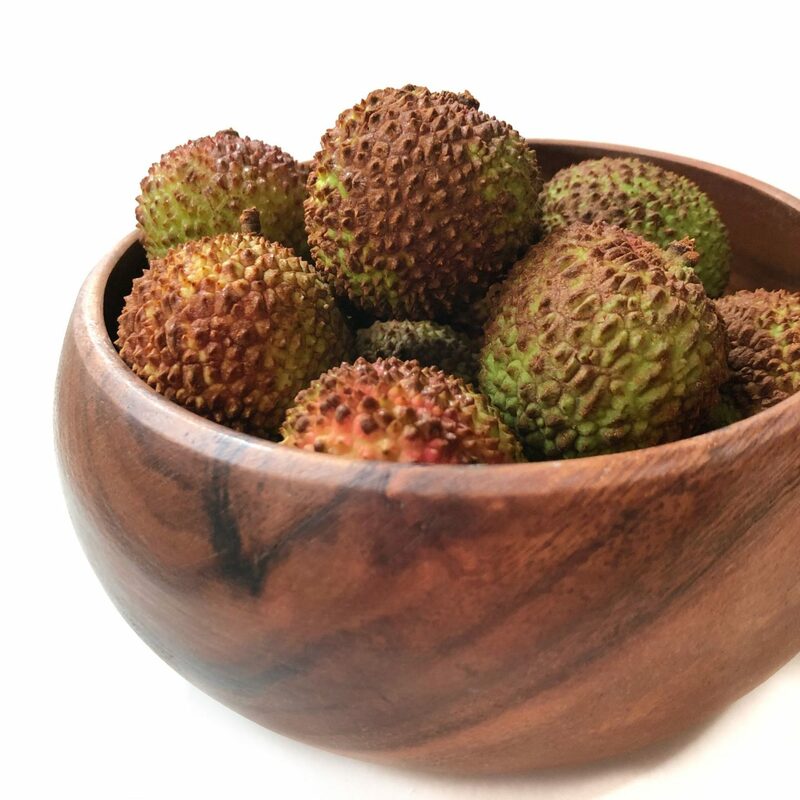 Fresh Lychees are seasonal. You have to catch the right time to buy so they appear juicy, sweet and have a white flesh. I like to mix fresh lychee bits together with whatever frosting I’m using to sandwich the cake layers. This time round, I opted for something different- Strawberry Coulis. It’s basically fresh strawberries cooked over medium heat with some castor sugar until soft and syrupy. I then fold this syrup gently into my prepared frosting so it does not mix homogeneously but you still get to see the red strawberry coulis streaks. 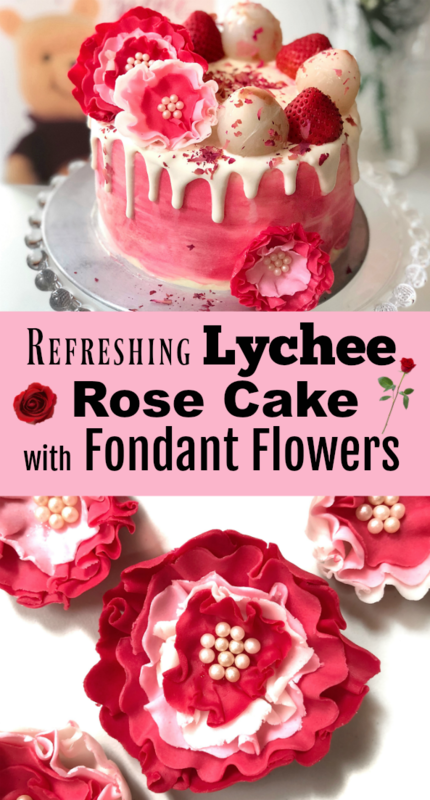 See those beautiful Ombre flowers on the Lychee Rose cake? I made them entirely out of fondant. It takes about less than 10 mins to make one and shorter with practise. I’ll include some steps in my next post as many of you have requested for a tutorial on this. I like to pair this lychee rose cake with a tangy cream cheese frosting. You can also pair this with yuzu buttercream or a tangy lemon curd filling. Mix and match till your heart desires. Hope you enjoy the recipe below. If you do try it, remember to tag me on Instagram @sherbakes so I can see your beautiful creation! Preheat oven to 175 deg cel ( 370 F). Grease and line 3 6″ Round baking tins with baking paper. Add 1/2 cup castor sugar, oil, lychee extract and milk to the egg yolk bowl and beat until combined. Add in cake flour mixture and mix until just combined ( Dont overmix). In a separate bowl, whip egg whites till foamy then add cream of tartar. Continue to whip egg whites until soft peaks then gradually add in the remaining 1/4 cup castor sugar in 3 additions. Fold remaining egg white mixture until the batter has been well mixed. Pour batter equally into the baking tins and bake for 20-25mins until toothpick inserted in the middle of the cake comes out clean. Heat strawberries and sugar in a saucepan until soft. Once soft, remove from heat and leave to cool. You can cool it in the refrigerator as well. It will thicken up as it cools. Place a layer of lychee cake on your cake board/stand. Frost down the sides and top of the cake. You can color the outing frosting if you like to get this ombre pink which I did. Looks delicious.. do I need to line only the bottom of the cake tin or the sides as well? Hi.. thank U so much😊. 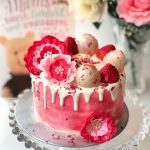 I made it last week for my daughter’s 1st bday, just lined the bottom…i just replaced lychee essence with rose water and I got a beautiful rose flavoured cake, layered with whipped cream and covered in whipped cream rosettes.. Awesome recipe, loved it.. thank U 😊.. np!! Glad you guys like it 🙂 It’s one of my fav recipes too!